The churchyard was photographed in a clockwise rotation starting at the east corner. Life for the church started with services in a carpenters shop on the Industrial site, then in Cassidi Hall (built in 1875 at the bottom of West Street) prior to the build and dedication of the Church on 29th. June 1880 at a cost of �2,822. The Vicarage was built in 1884 for �1,850 and in 1982 when the parishes combined the building was sold to become a private dwelling, until then the resident vicar lived in Morrison Street, which was adjacent to the land secured from Carlton Iron Works for the site of the church. 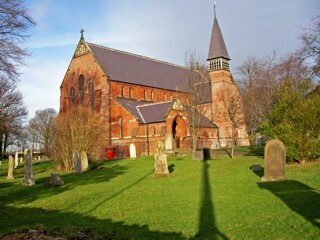 The Churchyard was consecrated in 1877. At the end of the 1914-1918 1st. World War, the Golden Eagle Lecturn was purchased by local parishioners as a memorial dedicated to the local men who had served, 30 of whom lost their lives and are are remembered on the Roll of Honour plaque in the Church, another plaque hangs on the North Wall erected in 1925 recording the dates of Office of all the vicars from 1872. The GPR holds 269 grave and 437 person records for the burial ground. There have been 81 requests for photographs from the burial ground.